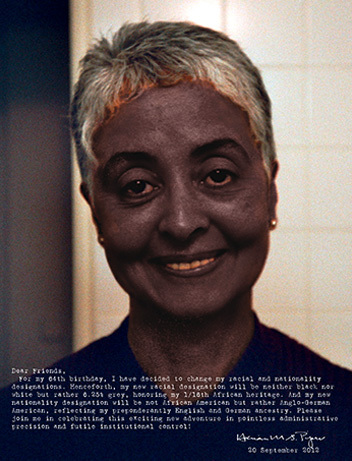 Adrian Piper, Thwarted Projects, Dashed Hopes, A Moment of Embarrassment (2012; digital self-portrait, 6 x 7.83” (15.24 x 19.97 cm)). Collection and © APRA Foundation Berlin. ← Adrian Piper has decided to retire from being black. In the future, for professional utility, you may wish to refer to her as The Artist Formerly Known as African-American.